The April Chart of the Month focuses on changes in degrees awarded in political science. 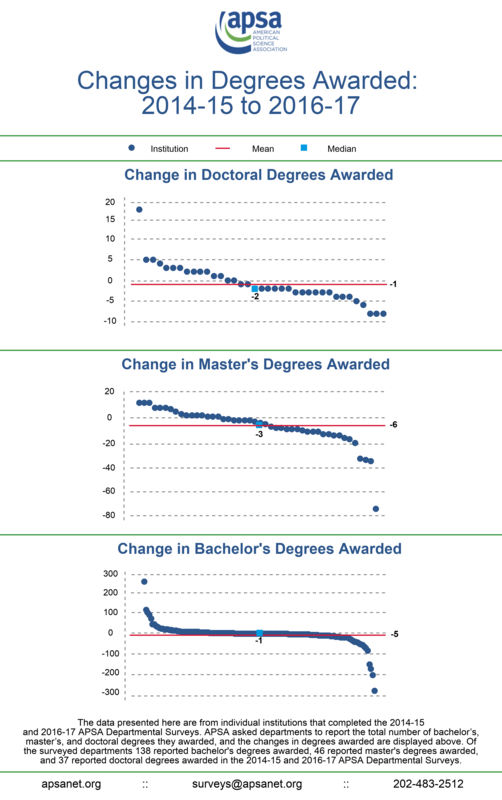 The chart highlights the changes in bachelor’s, master’s, and doctoral degrees awarded from 2014-15 to 2016-17. Overall, responding departments saw a slight decline in degrees awarded, which is in accordance with the trends seen in the National Center for Education Statistics’ (NCES) degrees data. For more information on NCES degrees data and wider trends in degrees conferred in political science and the social sciences, see the APSA Trends in Degrees Awarded in the Social Sciences: 1949-2016 report. To review other reports on the APSA Departmental Survey, as well as to read reports from previous years and on other surveys, please visit the American Political Science Association website. See the full PDF document here.